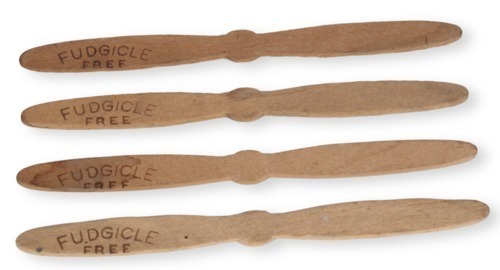 Wood fudgicle sticks from Scott Brothers Ice Cream Company of Topeka. The words "Fudgicle" and "Free" were concealed by ice cream. When a person ate the frozen treat, he/she received another one free if the stick was thus marked. The name changed to "Fudgsicle" in the late 1930s. Scott Brothers was founded in 1879 by Harry C. Scott and claimed to be the oldest ice cream manufacturer in Kansas.